"Although Jim, released in late 2010, shares with GATTACA the premise of widespread genetic enhancement, it’s much more subtle and nuanced. The film struck me with its stunning possibility, and the intentional gaps in the glimpse of future history still have me thinking a week later." Tom Crosshill's recent short story "A Well-Adjusted Man" takes a chilling look at the potential repercussions of erasing traumatic memories might have. In his interview with Lightspeed Magazine, talks about the psychology PTSD, the biochemistry of traumatic memories, and his inspiration for the story. Psychologist Alexander Weiss and his colleagues wanted to find out if the human "midlife crisis" that hits somewhere between our mid-30s and 50s could have a biological basis. They decided to survey zookeepers about of the mood of the chimpanzees and orangutans in their charge. They found that our great ape cousins seem to have lower sense of well-being during their late 20s to mid-30s - the equivalent to human middle age. It would have been nice if the study had included some quantifiable data, such as the level of stress hormones or other physiological measures. It's hard to know how much bias might be introduced by asking zookeepers to try to put themselves in the minds of their charges. But still, an interesting study. 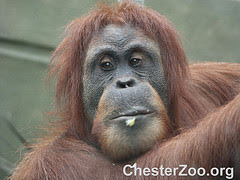 Image: Orangutan Portrait by Chester Zoo on Flickr shared under a CC BY-ND 2.0 license. A dramatic video showing the beauty of cells. The video was created by science teacher Frank Gregorio who makes "introduction" science videos for middle and high school teachers to use in the classroom. I wonder how well it works to capture the imagination of fidgety teenagers? Jasper the dachshund regained some use of his formerly paralyzed hind legs after his spinal cord was injected with cells grown from the lining of his nose. Robin Franklin and his colleagues at the University of Cambridge, used nose cells (or more precisely olfactory ensheathing cells) because, unlike most nerve cells, the nasal nerve fibers continue to grow into adulthood. The injected cells grew new nerve connections restoring function to the dog's damaged spine. While the treatment appears to have a lot of potential it will take a lot more research before it will be tested on humans. More about the study at the University of Cambridge. So if nucleic acids arose independently on another planet, would they have the same bases? Benner thinks not, unless the organisms were subjected to the same constraints. Some universal rules might apply, however." And short of discovering extraterrestrial life, it's only by synthesizing and testing new molecules to see if they might be functional in living systems.